Last week, on a freezing cold and rainy Winter day, we descended on the city centre branch of Glasgow spa Revival Retreat for a Dermalogica Prescription Facial. Revival Retreat offers a variety of non-surgical skin treatments, as well regular beauty salon offerings. It is clinical in appearance rather than cosy; but that didn't bother us as our skin needed some serious TLC to nurse it back to health. The Dermalogica Prescription Facial at Revival Retreat is very much a bespoke offering. The products used, and facial steps undertaken will be appropriate to your skin's needs on that day. We had no idea our skin was as dehydrated as it was when, at the beginning of our visit, we were placed under a UV scanner. Our therapist tucked us into a heated bed and began operation moisture restore. 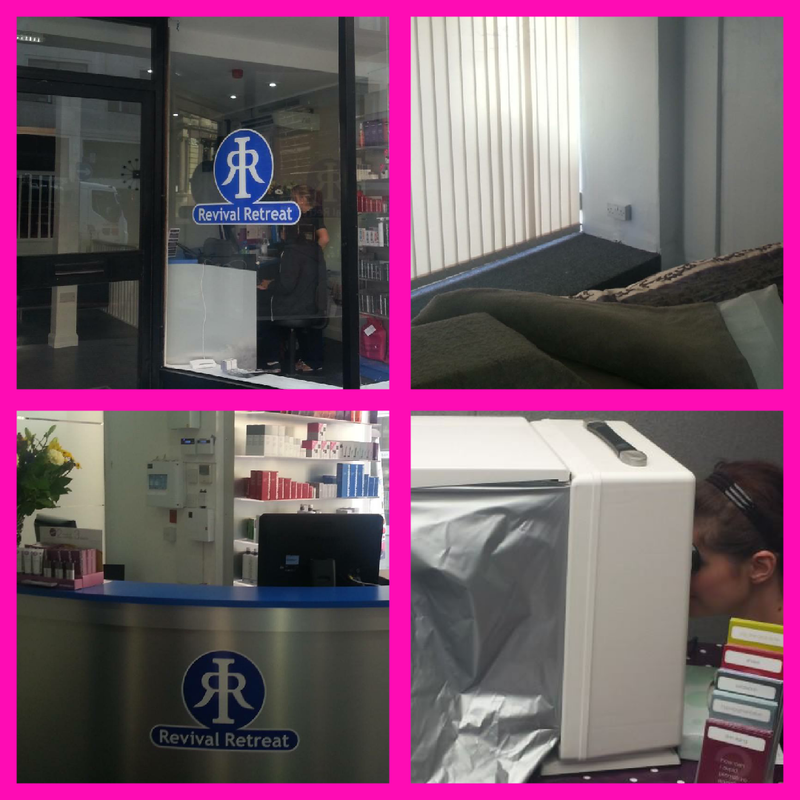 Our therapist was very keen to address our skin's needs, so everything that was done was to combat the issues that the UV light scanner, and the subsequent Dermalogica Face Mapping, had highlighted. We were even given little samples to take home at the end to keep the good work going. The therapist began with the Dermalogica Pre Cleanse- a deep cleansing milky emulsion to remove makeup and impurities from the skin, and to help the prescribed cleanser to penetrate the skin further. Next step was the Dermalogica Age Smart Skin Resurfacing Cleanser. This is a cleanser and exfoliant in one, and contains Lactic acid to prevent visible signs of aging by removing surface debris and accelerating cell renewal. After this, all the moisture was restored to our skin with the Age Smart MultiVitamin Power Recovery Masque which was applied under a gauze to help it penetrate the skin. This was left on for twenty minutes whilst our neck and shoulder muscles got some attention with a massage. After another cleanse, our skin was prepared for going back outside, with the Dynamic Skin Recovery SPF30 Moisturiser to acheive absolute hydration and to defend against the causes of skin aging. To our eyes, the Age Reversal Eye Complex (containing Vitamin C and tissue regenerating peptides to fight skin aging) was applied, and then a spritz of the Antioxidant Hydromist to add hydration and put a shield over the skin for our trip home through the city. Revival Retreat really did work wonders on our skin, and helped us to know what we needed to do to it ourselves to get it through the Winter. The strong head, neck and shoulder massage was a great treat, and we fell fast asleep when we got home. Due to the location of the salon- our treatment room was right on one of Glasgow's busiest streets and we could unfortunately hear both traffic and voices throughout our time there- we'd say Revival Retreat is best for skin treatments rather than relaxing spa experiences. A Dermalogica Prescription Facial at Revival Retreat costs £48 for a 75-minute treatment, and can be booked by calling 0141-237-3210.